DID YOU KNOW THERE ARE 75 PUPPETS IN THE SHOW? The Very Hungry Caterpillar, presented by Jeffery-Mohr Family Dentistry, is a story by author-illustrator, Eric Carle, that has delighted generations of readers since it was first published in 1969, selling more than 43 million copies worldwide. Carle’s well-known books have captivated readers with his iconic colorful hand-painted tissue paper collage illustrations and distinctively simple stories. His work has introduced generations of children to a bigger, brighter world – and to their first experience of reading. This timeless classic has made its way off the page and onto the stage. 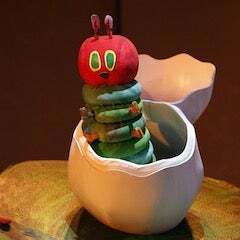 Created by Jonathan Rockefeller, the critically acclaimed production of The Very Hungry Caterpillar Show features a menagerie of 75 lovable puppets, faithfully adapting four of Eric Carle’s stories, Brown Bear, Brown Bear, 10 Little Rubber Ducks, The Very Lonely Firefly and of course, the star of the show – THE Very Hungry Caterpillar.